JP's Music Blog: CD Review: Singer/Guitarist Richie Kotzen Finds Time To Release The "Cannibals"
CD Review: Singer/Guitarist Richie Kotzen Finds Time To Release The "Cannibals"
Singer/songwriter/guitarist Richie Kotzen has been a busy man, first touring and creating a new album with his current band, The Winery Dogs and also touring to promote his recent greatest hits collection "The Essential Richie Kotzen" (review jpsmusicblog.blogspot.com). On January 8th, he released his 20th solo album, "Cannibals" which quickly shot to #1 on Amazon's New Rock Releases chart. Kotzen explains that some of songs on this new release were written as far back as ten years ago. The newest track on the album is the title song which has a rock/pop vibe built for mainstream radio. Kotzen adds a little soul to his singing of "In An Instant" and gets funky with his songwriting on "Shake It Off," adding some keyboards and horns to his sound. Kotzen invites King's X lead singer Doug Pinnick to duet with on the bass-lead rhythm of "I'm All In" as their voices work together perfectly. The classic sound of Kotzen shines through on "Stand Tall," but not before he returns to the gospel soul appeal of "Up (You Turn Me)." The album finishes with the piano ballads "You," which was written with his daughter and "Time For Payment," which highlights his vocals that sometimes get lost amongst the heavier songs in his repertoire. Richie Kotzen just wrapped up a string of live dates in Japan and will be planning on recording the next Winery Dogs' album later this year. 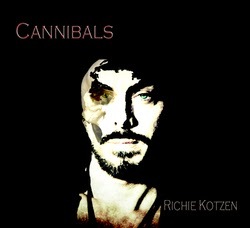 To find out more about Kotzen's new album "Cannibals," please visit richiekotzen.com.